My favorite desserts to make for big family meals or dinner parties can come together in a matter of minutes, or even as an afterthought. They don't require ingredients that are hard to find and they are visually impressive. 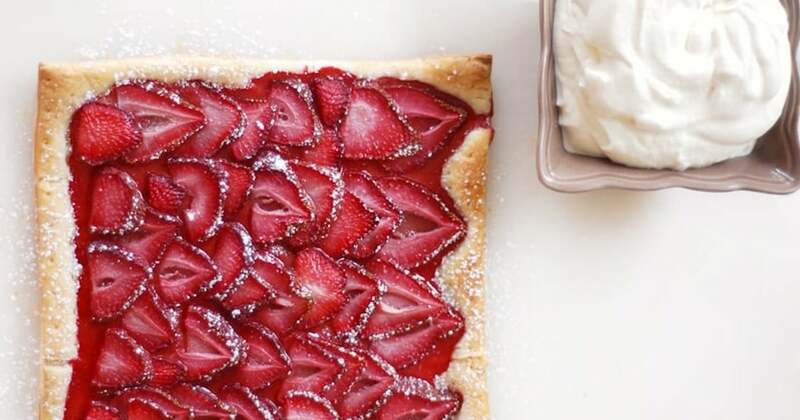 Such is the case with this simple strawberry tart. I got my hands on some bright red strawberries recently and immediately craved them on top of a buttery crust with a healthy dollop of freshly whipped cream. All you need are strawberries, a sheet of frozen puff pastry, whipping cream, and sugar to create a beautiful Spring dessert. Puff pastry can be a little bit tricky to work with. You'll want to thaw it ahead of time, but it needs to be kept cold so that you can easily work with it. After that, all you need to do is plop it on a baking sheet, slice and arrange your strawberries nicely, sprinkle a bit of sugar and bake until it begins to turn golden brown and the strawberries cook through. Finish with a dusting of powdered sugar and a dollop of homemade whipped cream. While this recipe technically serves four, it disappeared really quickly, so I would suggest making two for any kind of party. Place your puff pastry on a baking sheet that has been greased with butter. Neatly arrange strawberries over puff pastry, leaving 1/2 inch of crust around the edges. Dust with 1/2 teaspoon of granulated sugar. Bake the tart for about 15 or 20 minutes, or until the crust begins to turn golden brown and the juices from the strawberries begin to seep out. While the tart is baking, in the bowl of a stand mixer (or just a large bowl if you're using a hand mixer), add whipping cream, vanilla, and 1 teaspoon of granulated sugar. Whisk until stiff peaks begin to form. Remove tart from oven and dust with powdered sugar while still hot. Slice up and serve with a dollop of whipped cream.